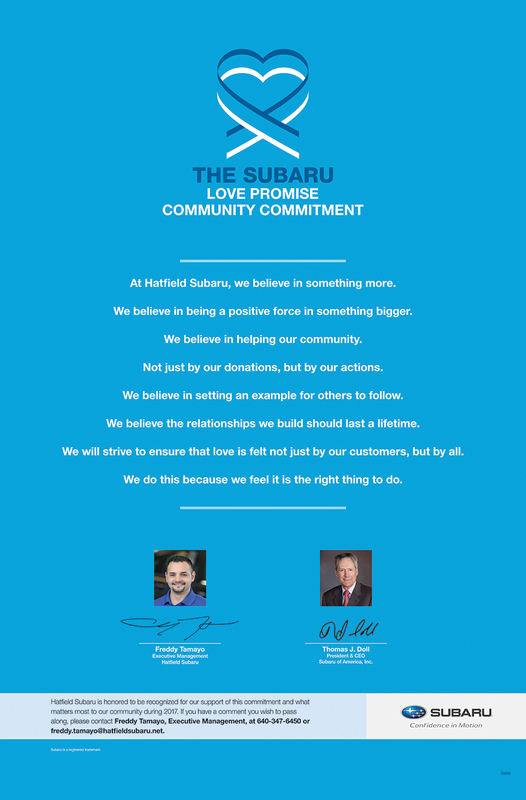 How is Hatfield Subaru dedicated locally to the Love Promise? Hatfield Subaru is fortunate to be a part of the Columbus community. We are proud and honored to serve our customers and other members of the community, and appreciate all the support provided by you throughout the years. We always make a conscious effort to show our appreciation by providing exceptional customer service, as well as contributing and staying active within the community. 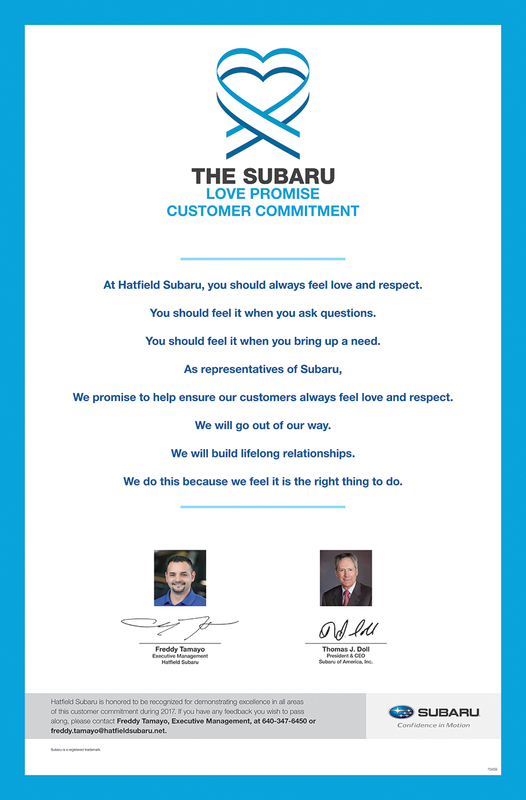 Did Hatfield Subaru go above and beyond, provide exceptional service, or support causes that are important to you? We'd love to hear about it. Thanks to the generosity of Hatfield Subaru and their sponsorship of RescuedOhio, my foster Fry and many more dogs like him this year will live to start their new lives with families, rather than be euthanized in a shelter. Fry came to me after being dumped at Franklin County Dog Shelter. I pulled him the day he was scheduled for euthanasia due to medical reasons. He had undiagnosed masses all over his body and fractured teeth, but he had such a bright spirit that he was a volunteer favorite at the shelter. After 2 surgeries to remove and biopsy the masses, and fix his teeth, Fry is cancer-free and thriving. 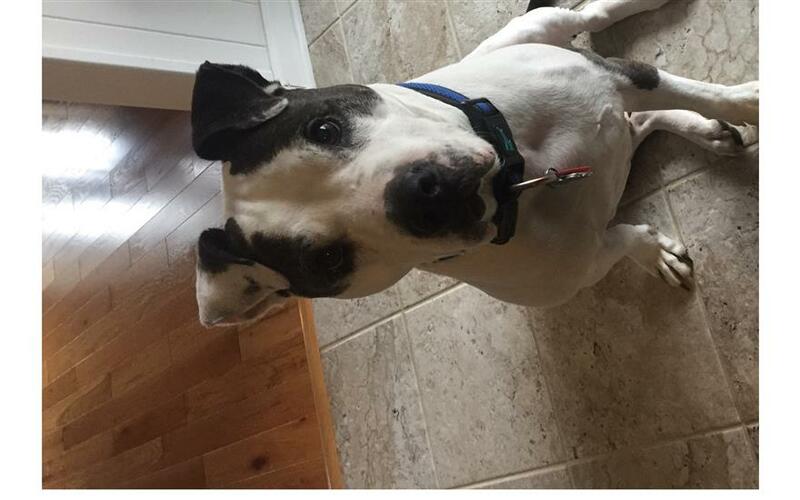 He is a very sweet older dog who loves meeting people, children, and other dogs, and he is alive and well thanks to everyone at Hatfield! I am a volunteer with RESCUEDohio, a central Ohio all volunteer dog rescue. We were so blessed to have Hatfield Subaru select RESCUEDohio as their local charity for Subaru's Share the Love event this past year. We take in and care for so many dogs, many needing expensive medical care and treatments as well as supplies and everything a foster home and pup needs to get off to a good start. Our volunteers spend much time and effort in fund raising and getting our dogs seen and adopted but we still can't keep up with the need. So when I saw the final Share the Love contribution to our rescue I was stunned and amazed by the generosity of Hatfield Subaru. I hope all who contributed in any way know they were involved in saving the lives of many dogs and helping them find great homes that not only helps the dogs but brings such love to their new families. You did more than "share the love" you shared life. Thank you. Hatfield Subaru is making a difference in our community with their “Share the Love” donation program. 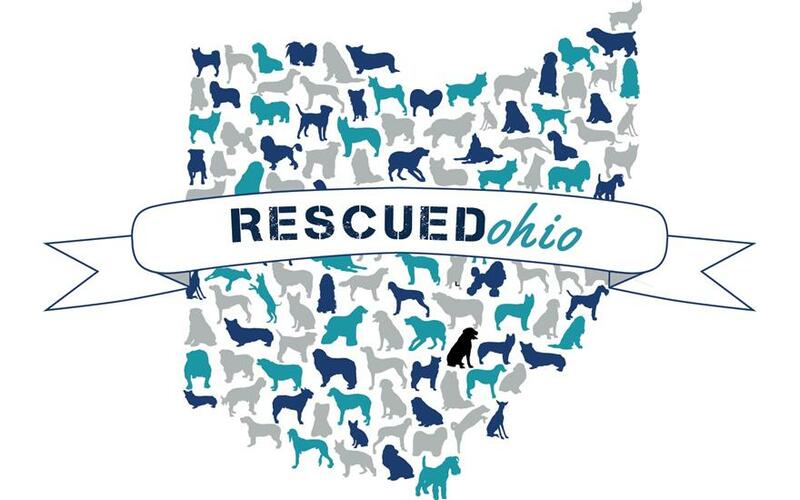 Their generous donation to RESCUEDohio enabled the rescue to save many dogs in need of homes. Food, medical care, and everyday supplies were provided to the foster dogs and helped these dogs find forever homes. 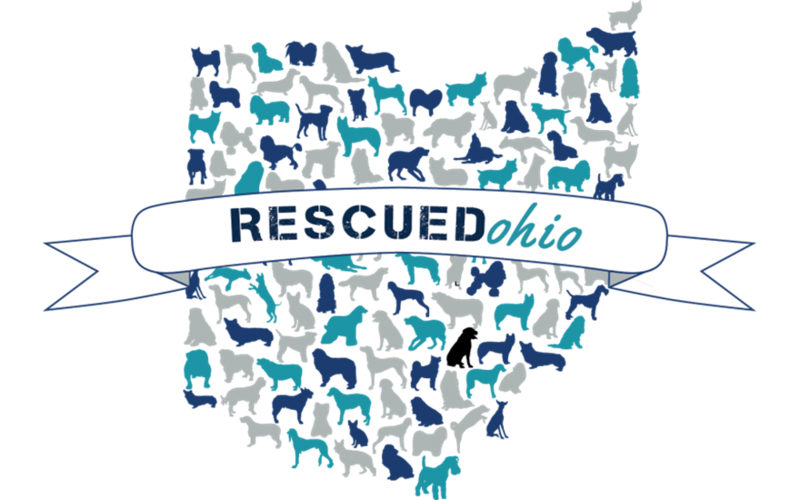 RESCUEDohio had many foster dogs with complicated medical issues in 2018 and the donation from Hatfield Subaru enabled the Rescue to help these dogs. Thank you for your support! Possibilities...that's what the generous contribution from Hatfield Subaru allowed RESCUEDohio give to many helpless dogs in 2018!¿¿ Those with more than the usual laundry list of vetting needs could get the extras...surgeries, amputations, mending broken bones, transfusions...the list goes on and on. Oh, what a difference you made for many abandoned and lost pups who needed the "love" the donation provided. Love is what so many rescued dogs need and want most - snuggles, a warm bed, toys to enjoy, daily meals, and most of all a place to call home! Generous donations such as the one you contributed do so much more than you could ever imagine. From a RO volunteer and lucky adopter of one of those loving souls you helped save - as the pictures depict...from sad with a fractured fibula to happy boy!!! Thank you, thank you, thank you!!! Subaru Hatfield chose RESCUEDohio as the charity for its hometown Share the Love event. 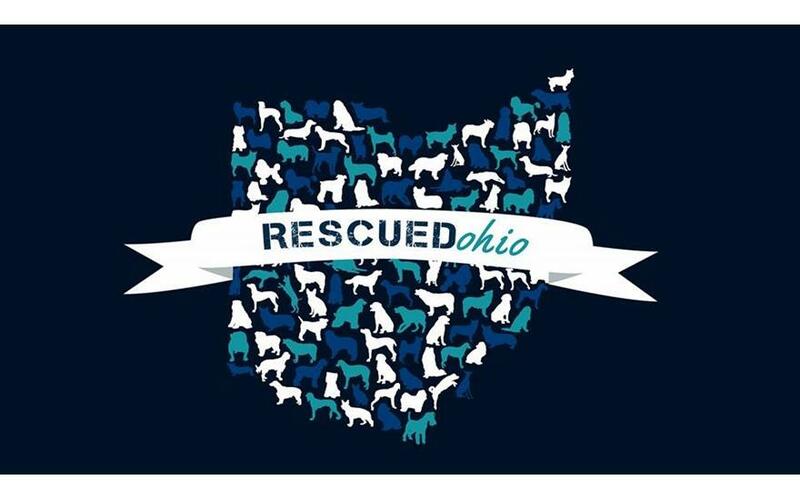 RO is a central Ohio dog rescue that rescues between 550-600 dogs a year. In 2018, we were able to save just as many lives as in previous years, but the lives saved were much more meaningful because of the donation we received. We were able to treat more dogs with medical conditions whereas, in the past, we would have been forced to say no. We helped Lucky, a German Shepherd mix, whose owner tied him outside and a rope was cutting off the circulation of his leg. 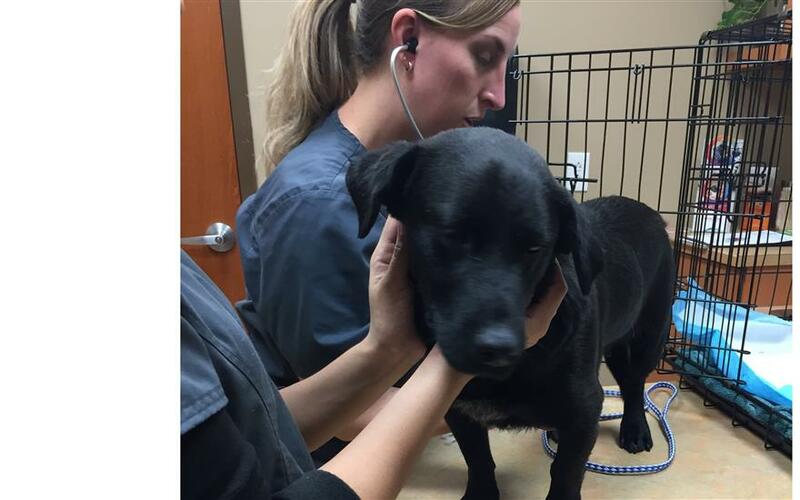 Lucky was rushed to our vet where he stayed for weeks. The doctors were worried about him losing his leg, but because of the fast acting efforts of rescuing him, Lucky’s leg is healed and didn’t need amputating. We rescued Badelia, a hound mix who was left outside by her previous owners and had complications from her spay. She had several surgeries and spent a few nights in the doggie ICU. She is healed and in her foster home waiting for a forever family. We were able to pay medical bills for Ollie, a young beagle mix who was diagnosed with an autoimmune disease. 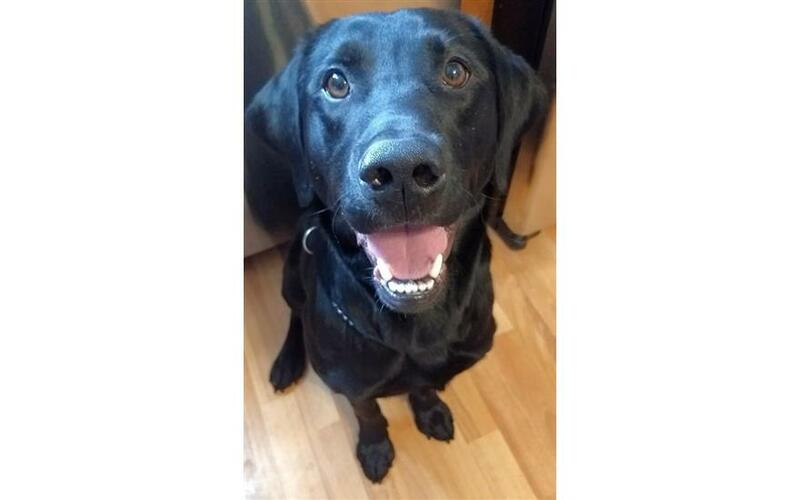 Ollie spent weeks visiting specialists for his disease, but unfortunately, he passed away. 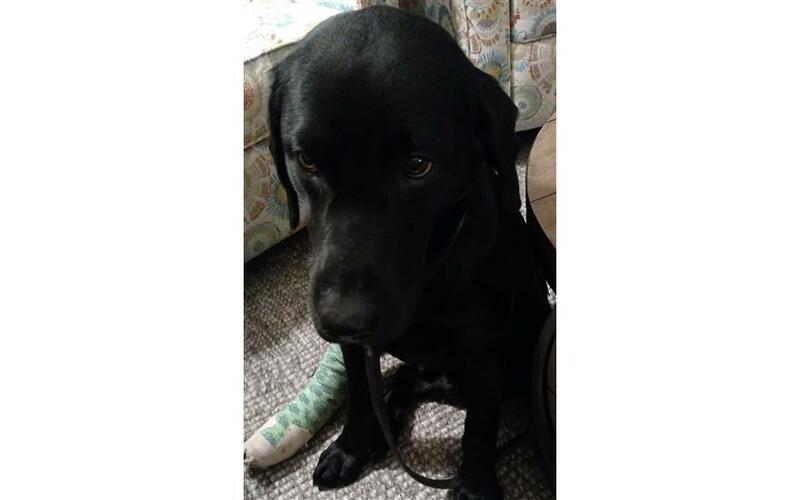 A good Samaritan found a dog on the side of the road who had been hit by a car. They rushed him to our vet where he spent days in the ICU. The vets were somewhat optimistic about him turning around, but he took a turn for the worse and we had to make a very difficult decision to put him down. The point in telling these stories is not to sadden anyone, but show how much the money has helped our organization. We hate turning any dog away but pride ourselves on paying our bills on time every month. As one of the directors of RESCUEDohio, I know we will be forever grateful for Hatfield Subaru for the donation that has been made. Thanks to Hatfield Subaru for making August 18th the coolest dog day ever! 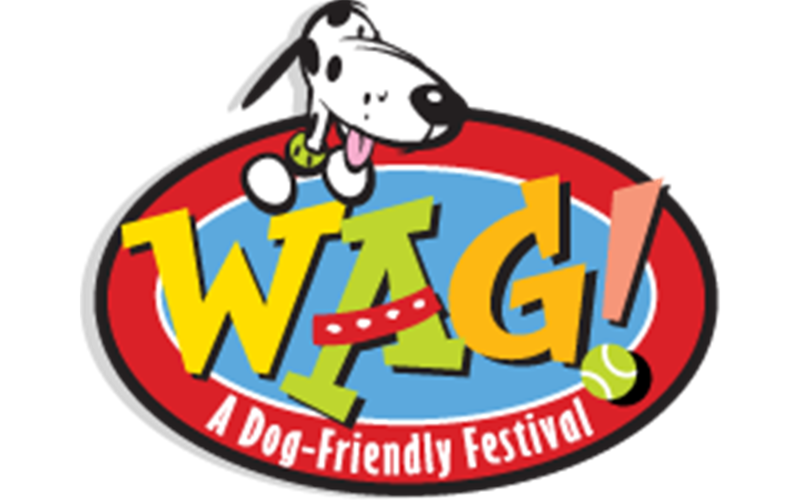 Thousands of four-legged consumers, along with their people, converged upon Prairie Oaks Metro Park for WAG! Fest, the Nation’s largest celebration of canine-human friendships. 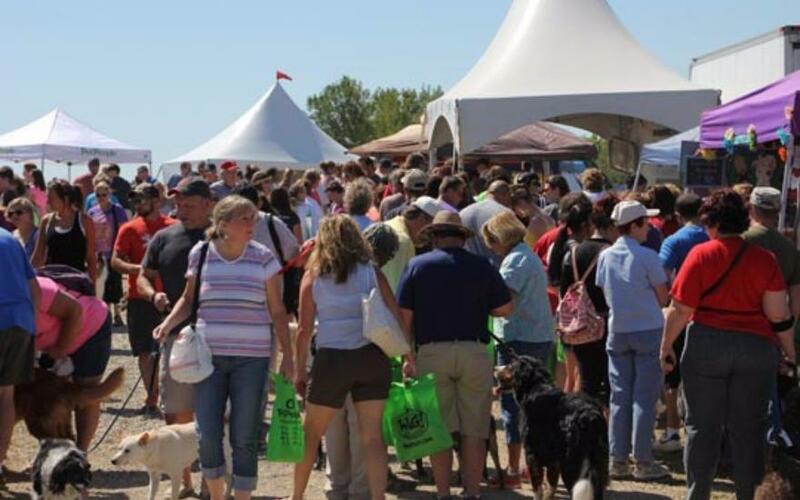 There were pet-friendly trails to wander and lakes to splash in, where the route to activities led past appealing booths where visitors could stop, shop and learn from the region’s best dog-related product and services providers. Thanks to Hatfield Subaru’s support, the event was able to achieve one of its most important missions of helping dogs in need. The festival helped over 40 central Ohio dog-serving organizations reach thousands of donors and potential adopters. 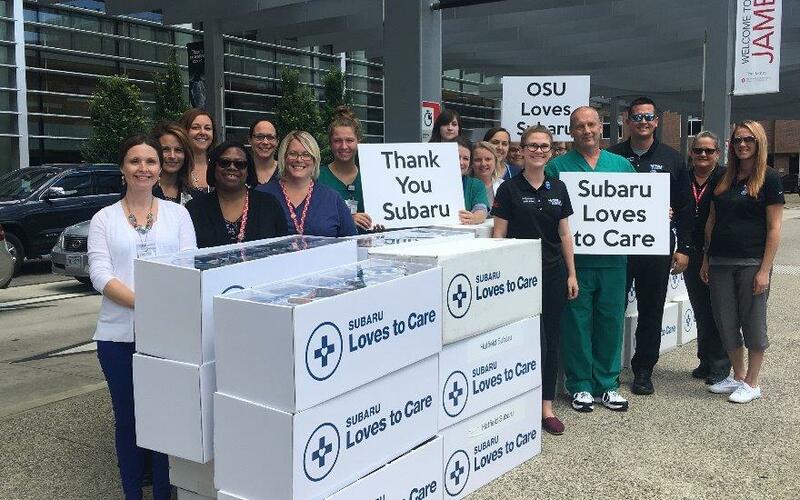 On Thursday, June 21 Hatfield Subaru joined The Leukemia & Lymphoma Society, Central Ohio Chapter to deliver 80 Subaru Loves to Care blankets, 25 craft kits and care cards to The Ohio State University’s James Cancer Hospital & Solove Research Institute. The dealership was greeted by cheers from James’ nurses, doctors, researchers and administrators who received the gifts on behalf of the patients. There were smiles on everyone’s faces as the group crowded around to help unload the Subaru. This year celebrates the third year Hatfield Subaru participated. Thank you, Subaru, for your commitment to cancer patients and survivors! August 19th proved to be the coolest dog day ever and Hatfield Subaru once again proved to be the dog-friendliest dealership in central Ohio. Thousands of four-legged consumers descended upon Prairie Oaks Metro Park for splashy games, contests, information and exhibits at the 10th Annual WAG! Dog Festival. A doggone good time was had by all. 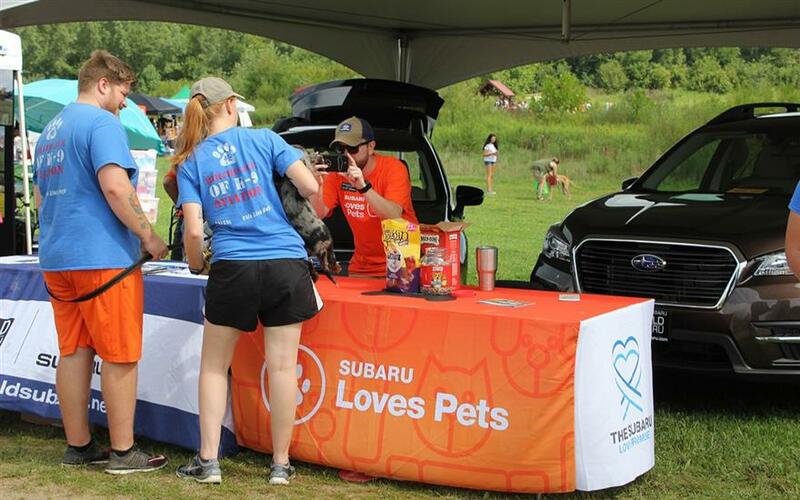 And thanks to the support of Hatfield Subaru, the event was able to help over 35 central Ohio dog-serving organizations reach thousands of donors and potential adopters. Hatfield Subaru joined The Leukemia & Lymphoma Society, Central Ohio Chapter to deliver Subaru Loves to Care blankets, care cards and craft kits to The Ohio State University's James Cancer Hospital & Solove Research Institute.The dealership was greeted by cheers from James' nurses, doctors andadministrators who received the gifts for patients. 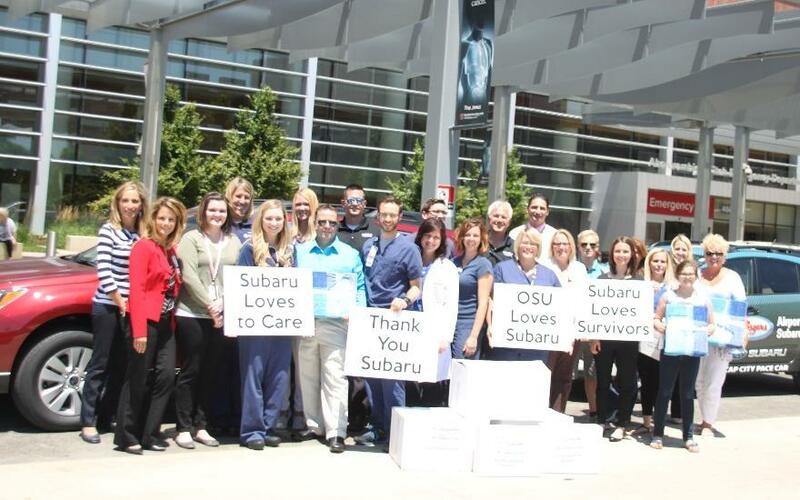 Check out the signs to show OSU's love for Subaru and helping cancer survivors. Thank you, Subaru, for your commitment to cancer survivors! 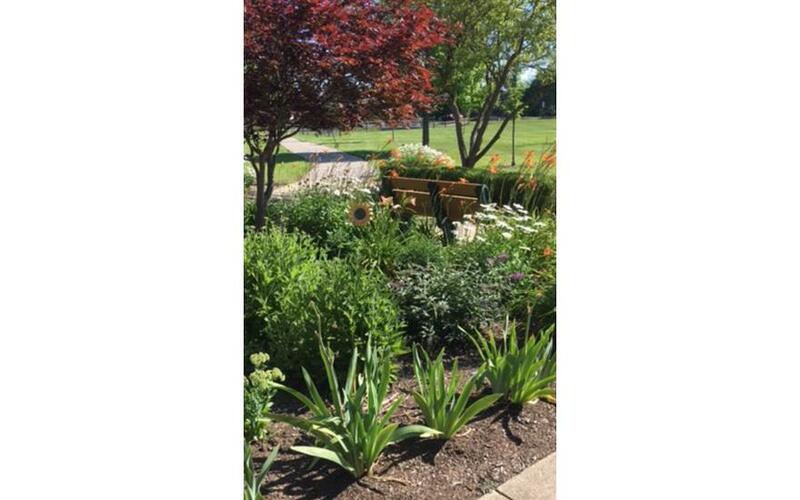 Our students love to sit on the bench and read their favorite books in our new garden. They have taken complete ownership by weeding, planting and caring for the plants. The Kindergarten students even created signs to remind their friends not to step on the flowers and take time to smell the flowers. 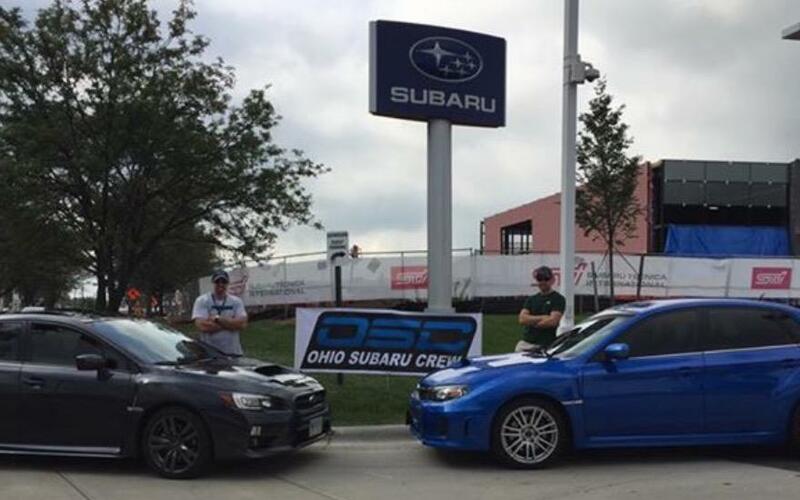 Ohio Subaru Crew (OSC) is a group of Subaru enthusiasts from Ohio and base in Columbus. 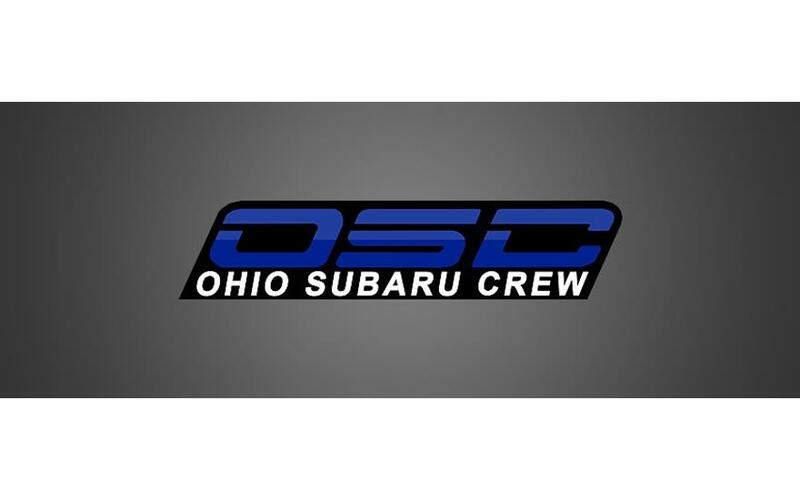 OSC was created for the purpose of the Subaru community. We can be located on Facebook, Instagram, YouTube. We are pleased the Hatfield Subaru has become a proud sponsor of The Crew. Hatfield Subaru has become the OSC Subaru dealership for car sales, parts and service by providing excellent and professional services. Our partnership has turned into "family and friends". A special thanks to GM Freddy Tamayo we call him Freddy T, without his dedication and hard work the 1st OSC meet would have not been possible. We look forward to growing our relationship with Hatfield Subaru. Thanks to Hatfield Subaru for participating as a marquee sponsor of the 2016 WAG! Dog Festival on Saturday, August 20. It was the perfect day’s adventure for dogs and people together. Taking place in the beautiful settings of Prairie Oaks Metro Park, there were pet-friendly trails to wander and lakes to splash in…where the route to activities led past appealing booths occupied by the area’s best dog-related product and service providers. WAG! Fest helps dogs in need. And, thanks to Hatfield Subaru’s involvement, the event was able to help over 30 central Ohio dog-serving organizations reach thousands of donors and potential adopters. 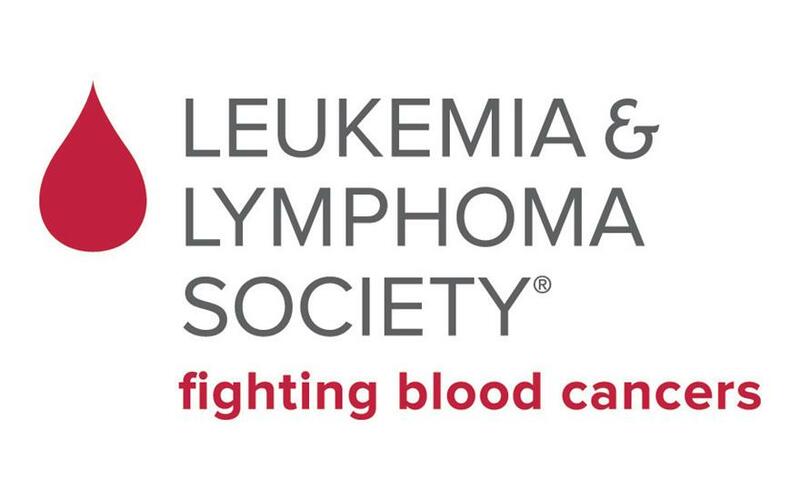 Hatfield Subaru joined The Leukemia & Lymphoma Society to deliver a "care"-a-van of blankets and care cards to blood cancer patients at The James Cancer Hospital. Hatfield employees presented doctors, nurses and administration with more than 100 packages for patients. 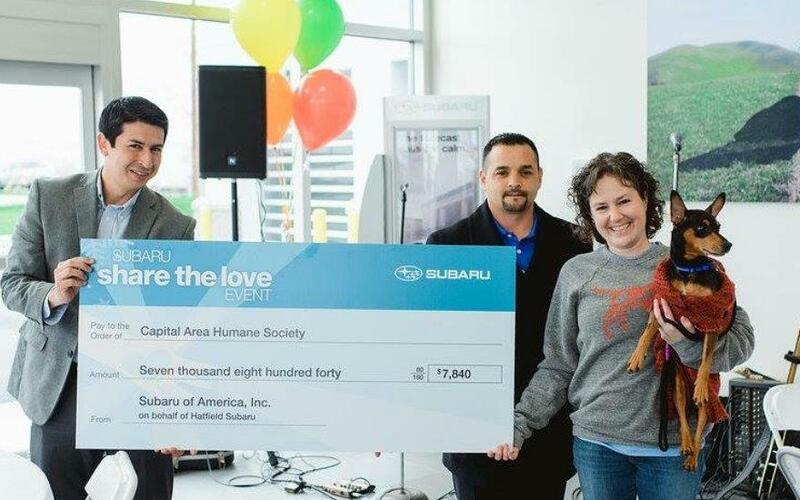 The Capital Area Humane Society was honored to be selected as Hatfield Subaru's Hometown Charity for the Share the Love event. Your generous support of the Capital Area Humane Society will make a huge impact on the lives of the animals that come through our doors every day. Our animals come to us in a variety of ways, from Good Samaritans bringing stray cats into our Animal Support Center to our dedicated Humane Agents rescuing dogs, cats, rabbits, pigs and more to our partner shelters throughout Ohio transferring dogs to us through our EmBARK program. No matter how they come to us, our entire team of staff and volunteers provide them with the veterinary care, socialization, and treats they need to ensure they are happy, healthy and ready to find their new homes! Your gift makes this work possible and will help save the lives of so many animals this year. Thank you Hatfield Subaru for your support. We are so grateful! 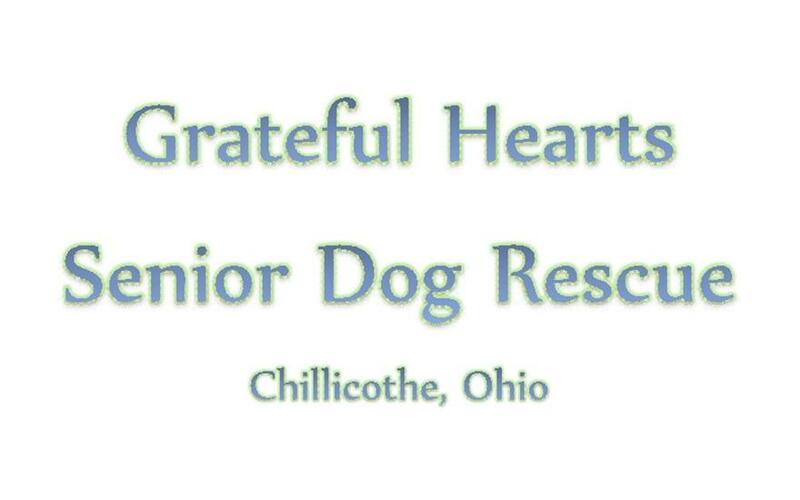 We were lucky enough to partner with Grateful Hearts Senior Dog Rescue from Chillicothe, Ohio on Saturday, October 24th for our Tricks N' Treats pet adoption & appreciation event. Grateful Hearts specializes in rescuing dogs from abusive situations or from euthanasia at high-kill shelters across the nation. They believe that every dog deserves to live a happy, healthy life until its natural end. We were joined by 4 of their loving, adoptable dogs and by the Columbus branch of BarkBox, who supplies boxes of high-quality dog products delivered to customers monthly. Dog friendly prizes were raffled off with all proceeds benefitting the ASPCA. Grateful Hearts walked away with several pet supply donations and some monetary donations and 1 of the 4 dogs was adopted. 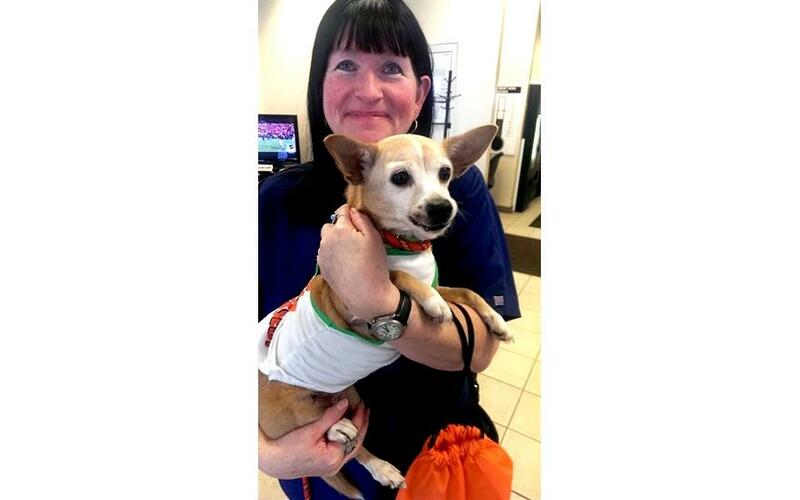 Ari, a senior Chihuahua and the longest resident at Grateful Hearts, finally found her forever home with customer, Carolyn. 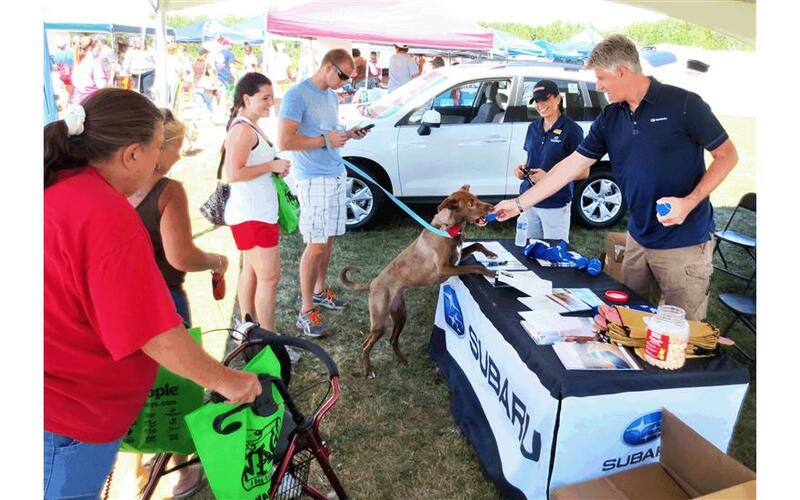 Hatfield Subaru in Columbus, Ohio was one of the main sponsors for the annual WAG, A Dog-Friendly Festival held Saturday, August 22 at Prairie Oaks Metro Park. The free festival featured many dog-related exhibits and activities, dozens of vendors with product samples and treats and several dog rescue groups and organizations with animals for prospective dog owners to adopt. The event provided dogs and their owners a unique opportunity to get valuable pet information, products and view demonstrations and performances. This upcoming school year will be my 5th year teaching at Franklin Heights High School as an Intervention Specialist. I will be teaching resource room English this year (which is a smaller class for kids who need a bit more support than the regular education classroom can provide). I will have the seniors this year, and was planning on implementing a senior project in which students would be required to research career fields, build portfolios, make meaningful contacts with potential employers, and complete community service (in an area of interest if at all possible). I was thrilled to hear that Hatfield had chosen to support my students and I; I will now be able to provide the supplies for my students to create long lasting portfolios and overall, give them the tools that they will need to obtain and keep a job in an area of interest after high school. I will also be able to buy the supplies that I need for literacy stations that I plan on using not only with the seniors, but with the sophomore class that I have as well. Many students are performing at different levels, and stations will allow them to work independently on goals specific to their needs while I work either one-on-one or in small groups with students. 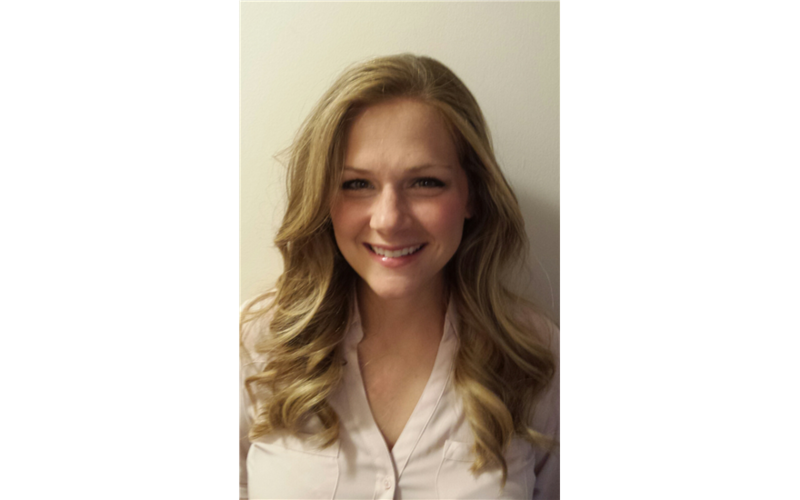 Having funds available will make this process much easier, and I think much more effective! We have some amazing kids at Franklin Heights, and I am so thankful to have the funds to make this year even more successful! I can't thank Subaru enough! 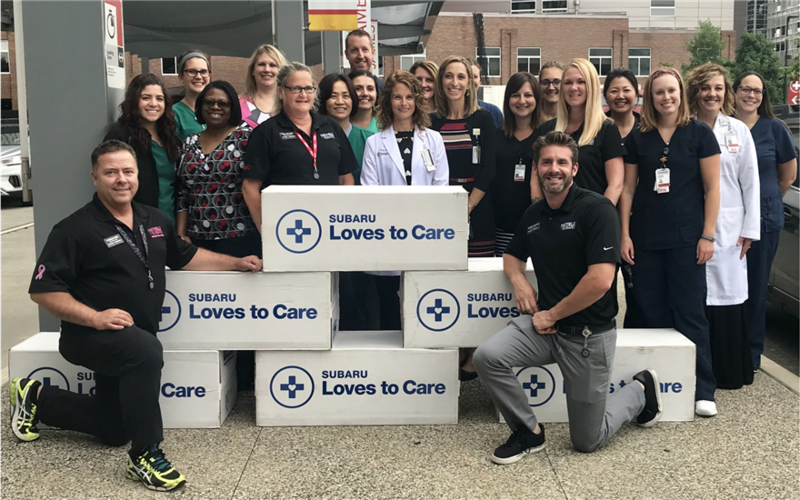 The decision for us at Hatfield Subaru to select Nationwide Children's Hospital for our Share The Love Hometown Charity was simple. We raised nearly $13,000 to benefit the children who have been stricken with life-threatening illnesses. As we have an associate who has a child at our dealership who suffered through leukemia, we felt obligated to Share The Love with Nationwide Children's Hospital and look forward to continuing this great relationship into the future.